I love this podcast! It makes me feel like Iâm chatting with some of my best friends. Kirsten & Graham are so fun and they keep me laughing with their off-topic side conversations. Iâd definitely recommend. I love listening to Graham and Kristen each week! They are funny, and it feels like they are sitting in the room with you! Love all their insights. I like the content of the show and how it relates to moms, although I do wish there was more home decor content. One thing I have a hard time with though is understanding what the ladies are saying when theyâre laughing for a long time but still continue to talk. Love this podcast! My best friend and I always listen and then discuss how similar our friendship is to Graham and Kirstenâs. It is always fun and interesting. Highly recommend. I adore this podcast. In my opinion, the best episodes are the ones where itâs just Kirstin and Graham because they are HILARIOUS. I laugh so much listening to this. Itâs so entertaining and I love the topics. I wish they did episodes more often! Feels like going to coffee or drinks with your best friend. This podcast always puts me in a good mood while I listening! Thanks ladies! I love this podcast! These 2 are funny and bright and really make my day better whether I listen on the way to work or coming home. They make me feel like Iâm one of their friends in on the convo and Iâm happy to be there with them. Thanks! Look forward to every episode!!! Iâve been listening to Kirsten and Graham for almost two years and I look forward to every new episode! I especially enjoy their banter and chemistry. I also look forward to their interviews. They ask the questions I either always wanted to ask or didnât think to ask. One of my favorite recurring episodes is their âWhatâs In and Whats Outâ episode at the beginning of each new year. Just found your podcast in December and have binged ever since. I am almost caught up! I love the variety of content that you offer and especially love your more controversial episodes as they are great food for thought and a really fun listen. You always make me laugh and I teach me something new. I really enjoy these two ladiesâ banter about all different topics having to do with real life for moms and homeowners. They often have informative guests on the show, too, with great insight into all different topics. Thank you for keeping the show fun and light, ladies! Keep up the good work. I feel like I'm talking to my best friends! My new all-time favorite podcast! So uplifting and inspiring, and always with the BEST tips about living a gracious life. Highly recommend!! I really want to keep listening to this podcast, but I am growing weary of Kirstenâs interruptions and laughing through her speech, to make it difficult to understand. I get it that some friends do this, but it is super annoying in a podcast. If this could be improved and conversation can say *somewhat* on topic, it would be a huge improvement! 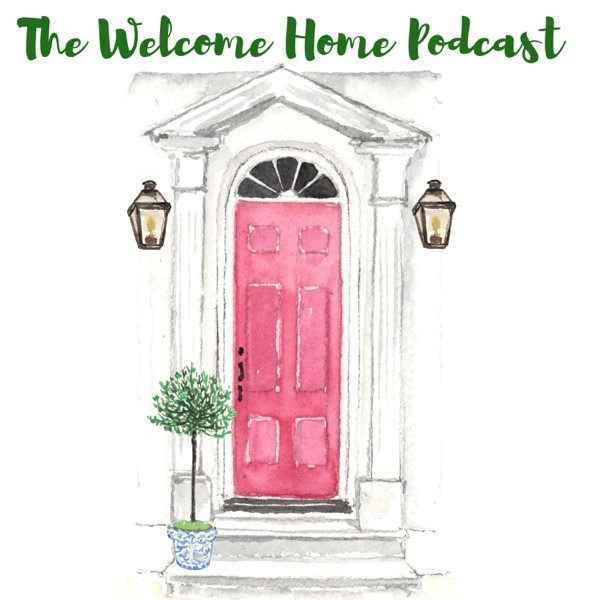 Kristen & Graham, hosts of the Welcome Home podcast, highlights all aspects of homemaking, family and more in this canât miss podcast! The hosts and expert guests offer insightful advice and information that is helpful to anyone that listens! I am absolutely adoring this podcast - I canât help but feel like Iâm in a hilarious conversation with my own BFF roomie from college. I love their laugh-filled conversations so much â hooked on this podcast from the very first listen! Found them through The Mom Hour and I canât wait to binge them all! This podcast is so much fun and the hosts, Kirsten and Graham, are funny and charming. The content is a perfect mix of informational and inspirational tips for gracious living and real-life strategies for modern families. There also frequently fantastic interviews. Itâs one of my favorites! I adore listening to these two. Itâs like having friends over for coffee. They are funny and smart and add so much to my day. Why, you ask, is K&Gâs long distance friendship saving my personal relationship? Because if they lived in the same city, I would move there immediately. Leave everything behind and try to work my way into this best friendship. I love everything about this podcast, from the sponsored ads straight through to the banter. The controversial topics (helloooo Penelope Trunk!) and hearing the little snippets about their personal relationships ...and of course, the design talk! I try to let weeks go past so episodes build up so I can binge listen to multiple in a row...I canât get enough! Love you both!! The hosts are always interrupting each other and I feel like they could talk about more practical home stuff. My favorite podcast for Moms! Whereâs the design and diy? Where is the design and diy content on this show? The hosts are so fun, I find myself laughing along with them all the time. Great interviews and hilarious hosts! This is my favorite podcast! I recently discovered The Home Hour, and I am absolutely hooked. This is BY FAR my favorite podcast!! Each episode discusses a new and different topic pertaining to women, which keeps it fun and exciting. Kirsten and Graham invite incredibly interesting speakers to discuss all different topics. They challenge their listeners to think differently and in new ways about each topic. I canât say more good things about this podcast!! Iâm so glad I found it! I look forward to the days a new The Home Hour episode releases! Graham & Kirsten have a great banter with each other and with their guests! The topics are always of interest and Iâve definitely implemented more than a handful of their suggestions such as a meal planning system that actually works (#84), goal setting for families (#78), beauty tips (#104) and back to school routines & rituals (#82). Keep up the great work! I stopped listening after hearing a 2,500 square foot house called âsmallâ. As someone who feels extremely fortunate to live in a house 400 square feet smaller, I found this completely out of touch with a lot of peopleâs realities. Enjoyable show. Only giving 4 stars because it could use a little more focus (less random chatter) and especially less chatter about wine. Great podcast. Filled with entertaining anecdotes and practical advice on a variety of topics. Definitely worth a listen! Good concept- however, hosts are not kind to each other or down to earth. I might have had unrealistic expectations (or hopes) for this podcast since I jumped from the mom hour which is more relatable. This podcast is full of topics that interest me. I always get some great tips and ideas when I listen to an episode, even when I think I know a lot about the topic. Graham and Kirsten have a wonderful rapport. They're very funny and genuine. Listening makes me feel like like I'm sitting in on their lunch or cocktail hour, and the episodes fly by quickly. I only disovered this podcast in the past couple of months but like it so much that I've gone back and listened to some older episodes in addition to subscribing to new ones. Kirsten and Graham have such a fun rapport and put out a fabulous podcast! Always a delight! Real, fun, & feel good! I look forward to every Thursday when The Home Hour drops a new episode and I can tune out the rest of the world. It makes a drive, a run, chores, etc. much more enjoyable. Graham and Kirsten are so relatable and make me feel as though Iâm a part of the podcast. They make me laugh and load me up with useful tips ready to conquer my crazy day. I just feel good and recharged after listening. Love this podcast. The hosts are so funny and really don't take themselves too seriously. I've been inspired to make homemade cleaning products and to throw a more exciting dinner party. It is a great mix of every day and elegant. I love listening to Kirsten and Graham. They are funny and well spoken. This podcast has quickly become one of my favorites to listen to. They talk about a variety on subjects- from home design to meal planning to organizing and entertaining. Iâve picked up so many tips and tricks to use in my everyday life and I look forward to listening every week. They are fantastic! I wait eagerly every week for this podcast to be released. Graham and Kirsten are smart and articulate. They have interesting perspectives on a wide range of topics, and I find their content applicable to the modern women. Love all the great ideas I get from this podcast! The hosts are energetic and keep everything "real", which is refreshing when we're all leading such crazy lives! This podcast hosted by two young mothers is excellent: witty and insightful. It consistently entertains and informs. This podcast really inspires me to makes positive changes in my life! I love listening to these two ask experts exactly what I would ask. They laugh a lot and seem so real. I always get ideas to help me do better in my home and life. In this past weeks episode (menu planning) I felt as the directions that were given for the whole excel binder would have been made better for a blog post. I was so excited to listen to this episode when it popped up but stopped listening halfway through. And this is not the first time I've stopped mid show. I felt like there was so much chatter but mostly about excel sheets and not about actual helpful planning. I feel the hosts need more practice and hope in the future they can stick to an outline of some sort. I really want to like this podcast, but the hosts are both grating to listen to. The sound quality is terrible which makes it hard to listen to to begin with, and then Kirsten cuts off Graham and guests all the time which is really annoying! I wish she could listen to herself and just slow down with hearing herself speak and not letting others respond. The meal planning episode was a trainwreck. It was a waste of time to listen to because you couldn't follow it at all and Kirsten kept interrupting because she almost seemed like she just couldn't possibly follow a simple idea. I think I might've finally reached the point where I'm unsubscribing. Really wish the sound quality would be improved, can be grating and hosts have vocal ticks like sniffling that make it difficult to listen. Better planning could also make "pointers" eps like the menu planning one easier to follow. Hosts seem very well off economically and not very relatable to wider audience. I was a listener to this podcast back when it was hosted by meaghan Francis so I wasn't sure I would like it with new hosts. It took me a while to give it a chance but now I love it! I feel like I learn something helpful with each episode I listen to. The new episode about meal planning is what finally pushed me to leave a review. I learned so much! Thank you and keep up the great work! I love the content...I just can't listen because the sound quality bothers me. I really enjoy Graham and Kirsten's chemistry. What some reviews seem to see as rude I just see as banter between friends. Both hosts seem to have a much more upscale lifestyle and party scene than I'm accustomed to, but I can still get tips and ideas from them! Having just relocated they're inspiring me to break out of my comfort zone and host some parties in my home!I always look forward to new episodes! Thanks Graham and Kirsten! I love the Mom Hour, but just can't get into the Home Hour. Kristin and Graham do not always have a clear focus on their subject and seem to be in a totally different world than me. The podcast quality is not great, kinda crackly. Episode 80 and 81 were fantastic. I have been listening since Kristin and Graham started and I can't get enough, I look forward to the new episode each week. So fun, lighthearted and REAL! I've been stalking my itunes feed every week to check for the latest update from Graham and Kirsten. Their show, The Home Hour, has become one of my must listen to podcasts. Their tips for all things home including parties, decor, food, etc are always delivered in a very fun and lighthearted manner. Feels like I'm hanging out with girlfriends drinking a cocktail getting lots of good advice. Thank you! I really enjoy your show. These hosts are so much fun! It feels like I am sitting around talking with good friends about style, home renovations, and entertaining. I can't wait to listen each week! Thanks ladies! Practical and entertaining. A great podcast for all things "hosue and home"
This podcast is not only a ton of fun to listen to, but it's also quite useful! The tips that Kirsten and Graham share are very helpful and get you thinking. They cover a wide variety of topics and they always offer good insights and ideas. I always get excited when I see a new episode in my queue!